Yorkshire’s Ingleborough is a curiously shaped hill, large and looming. 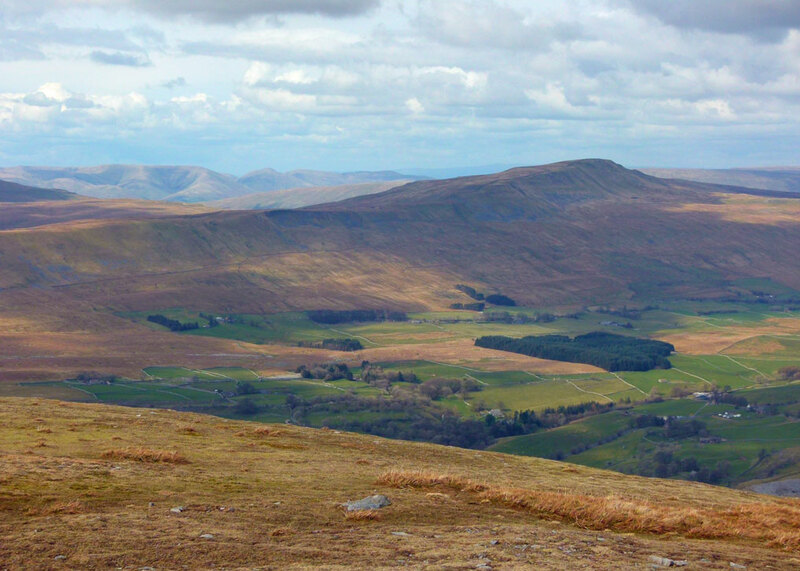 That said, there are bigger features in the world, even in our ever-modest Britain; but being over the benchmark height of 1,000’ (2,372’ or 732 metres to be precise), Ingleborough qualifies to call itself a mountain. 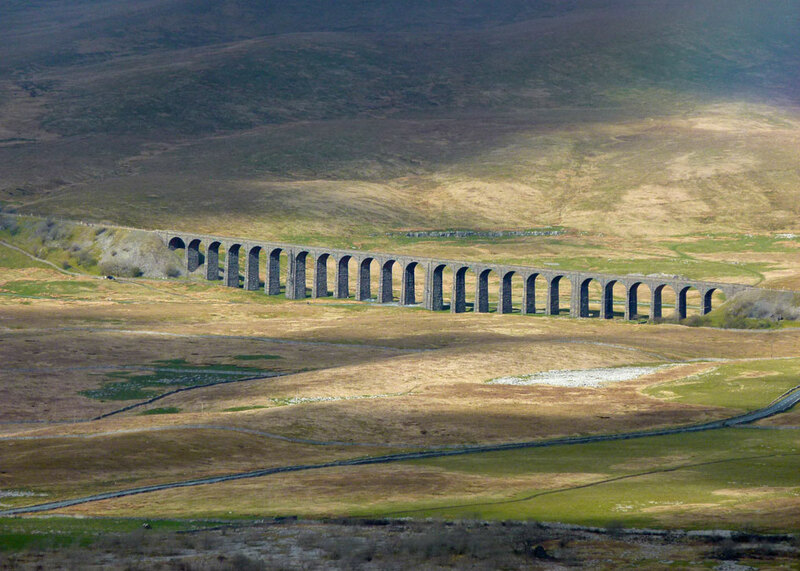 Locally, it’s known as a ‘peak’ – one of the famous Three Peaks of the Yorkshire Dales, the others being Pen-y-Ghent and Whernside. And, like most places, it has its secrets. 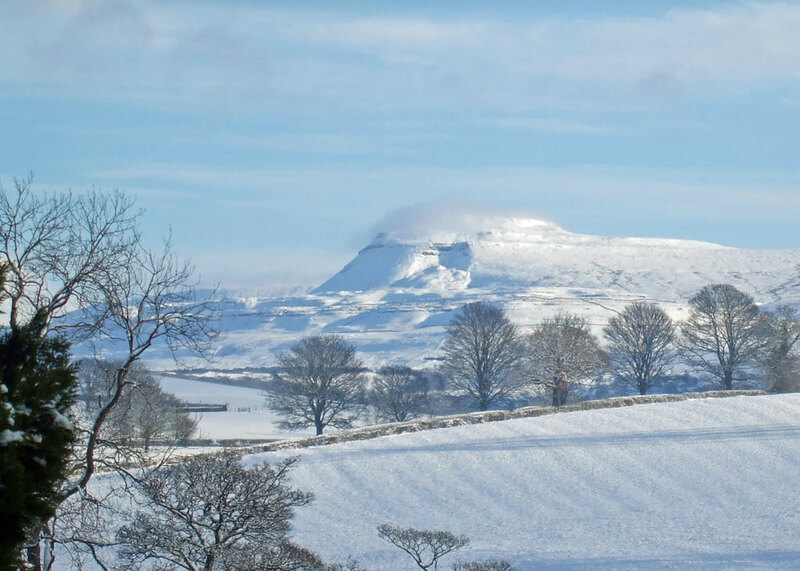 Gullible visitors, when seeing Ingleborough for the first time, can be persuaded that it’s an extinct volcano. I know, because I’ve done it. Actually, it looks nothing like a volcano. But, except when shrouded in mist, it does dominate the skyline because, apparently, the top has a cover of millstone grit which is much tougher than the underlying and surrounding carboniferous limestone. That’s enough of the technical stuff – if you want to know more about that, find someone who knows what they’re talking about. Otherwise, just be content that Ingleborough has a beguiling profile that demands to be noticed. You’ve just got to get to the top, haven’t you? The summit is a broad plateau, from which there are stunning views across Yorkshire and, to the south and west, Lancashire and Cumbria as far as Morecambe Bay and the Irish Sea. This is on a clear day; I have walked Ingleborough in near blizzard conditions when you can barely see the way ahead. Our Iron Age ancestors built a fort on the summit, which had a stone wall around the entire mountain top. It was perhaps a stronghold of the Brigantes, the tribe that lived in these parts two thousand or so years ago, and who fought vainly against the systematic Roman conquest of the southern half of Britain. The remains of circular stone structures are thought to show the location of Brigantean roundhouses, though some experts now believe the structures might be eroded burial cairns. Perhaps these are the relics of some long-forgotten ritual; perhaps Ingleborough’s individuality gave it a sacred significance. Some folk believe that the Romans mooched around the place too, possibly establishing a signal station there. You can understand why they might, because it’s a great place for a lookout as well as a fort. Your enemies would not only find it hard to conceal themselves (except in the blizzard conditions referred to earlier), but would also be knackered by the time they eventually reached you. I fear that whatever the Brigantes called their fort might be lost in the mists of time. The name we use, Ingleborough, is probably derived from the Anglo-Saxon ‘burg’, or ‘burgh’, meaning ‘a fortified place’; not sure about the ‘Ingle’ bit – this might mean ‘fire’, or ‘light’ (so, a beacon, perhaps?) – or it could be a personal name. 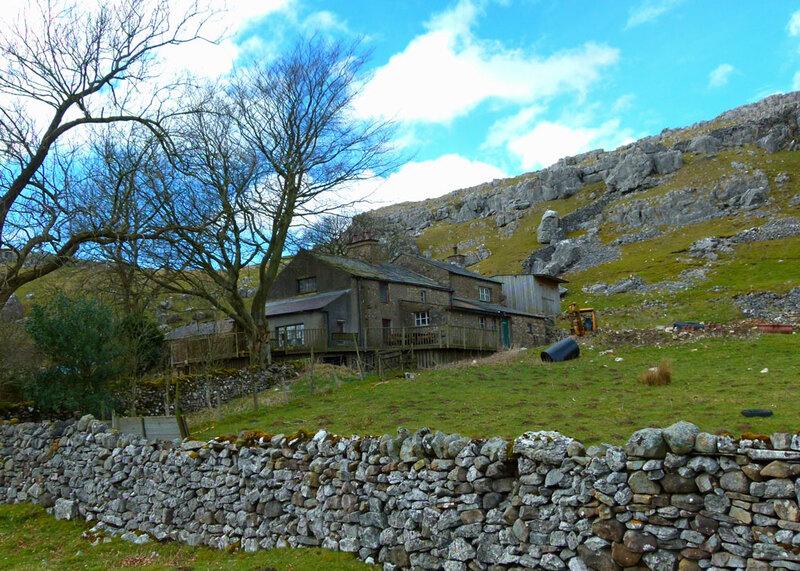 This part of the Yorkshire Dales is caving country and the limestone of Ingleborough conceals a maze of caverns and passages – including the Whitescar and Ingleborough show caves. It’s a damp part of the world; the terrain can be slippery – and treacherous; it’s best to stay on the established path and away from ‘shake holes’ – sometimes known as ‘sinkholes’, these are depressions in the ground where water has eroded the overlying soil and underlying rock, and they can cover deep caves. There are several well-maintained paths to the top of the mountain from every imaginable direction. 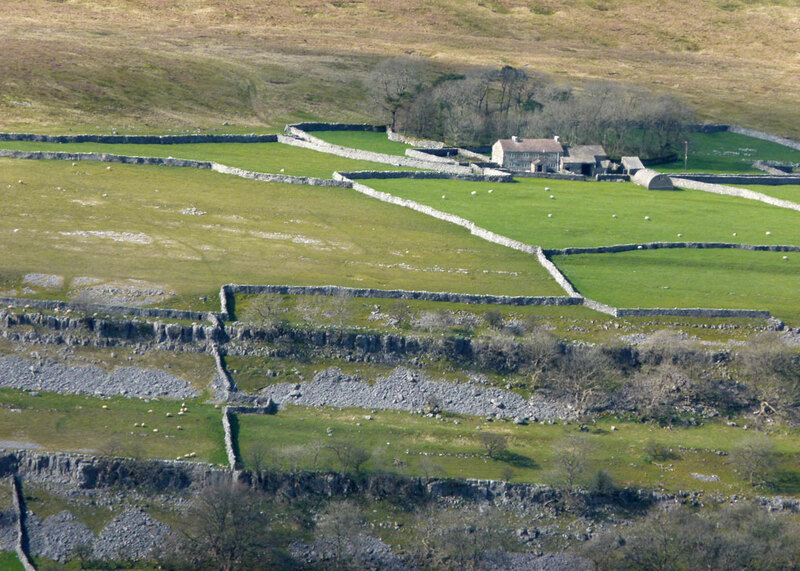 The most popular starting point is probably from the large village of Ingleton. The route from here is a straightforward slog, with some scrambling at the end, and some great views of Whernside along the way. I like the arguably more interesting route from the smaller and undoubtedly more picturesque village of Clapham. 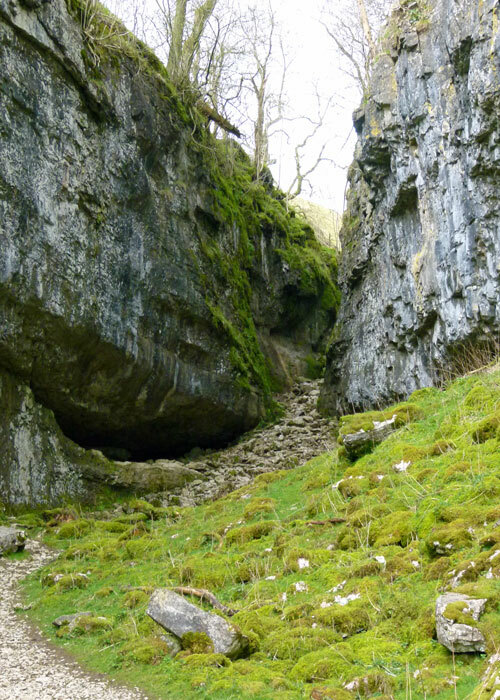 Here you have the option of starting the walk (for a small fee) through a pretty nature trail alongside Clapham Beck, but you can take another parallel path if cash is tight, rejoining the trail just before Ingleborough Cave. The route heads up through Trow Gill – the only piece of serious scrabbling on this route – and on to Gaping Gill. Trow Gill is a collapsed cavern, a small gorge. Gaping Gill is a natural fissure, or pothole, some 322’ (98 metres) deep, fed by the Fell Beck which tumbles into it, becoming the longest unbroken waterfall in Britain. The cave at the bottom is the second largest underground chamber in Britain, as big as the nave of York Minster. Sometimes, local cavers erect a winch over the top and lower people down for a fee. Rumour has it you pay to be hauled up – I’ve never tried it and don’t want to; but it’s worth peering over the top, if you’re very careful. 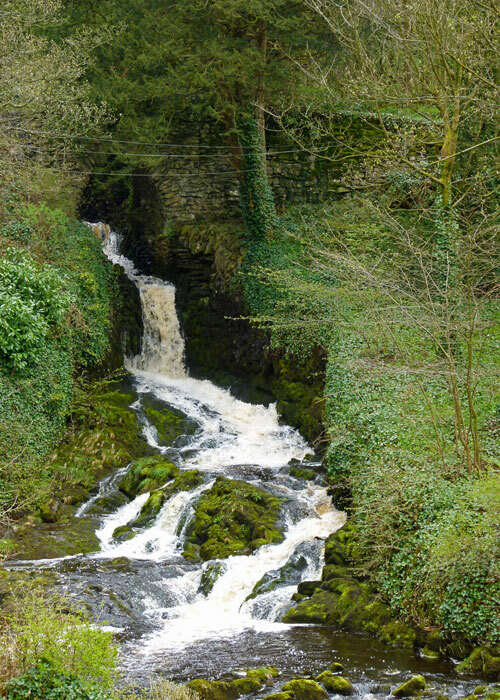 You might hear local folk tell of the Witch of Clapham, one Alice Ketyll or Kettle, who was said to occupy a ramshackle hovel near Trow Gill in the 15th century. With the help of the Devil and nine freshly killed cockerels, Alice is said to have conjured up 500 troops to assist the Lancastrian cause espoused by the owner of nearby ‘Clapdale Castle’ during the Wars of the Roses. Alas, the tale was borrowed (with some modifications) from Kilkenny in Ireland, where a Dame Alice Kettle was tried for witchcraft in 1324. ‘Clapdale Castle’ is allegedly Clapdale Farm, a former fortified manor house. But Trow Gill offers a more recent mystery. On 24th August 1947, two friends, Jim and Budge, were nearby looking for new potholes (caves) to explore. They found one and had climbed down about 10 feet when they spotted a pair of shoes protruding from under a rock. The rock obscured a body, in an advanced stage of decomposition. Subsequent forensic examination revealed that the skeletal remains were those of male, aged between 22 and 30 years, 5’ 5” tall with light brown or auburn hair. He had been dead between two and six years and had been wearing a suit, shirt and tie, with a tweed overcoat and a grey trilby hat. A plum coloured scarf had been over his mouth at the time of death. Close to the body was a glass bottle containing sodium cyanide and the man also possessed a separate ampule of the same poison. The man had another pair of shoes with him, a mineral water bottle of local type and various personal items such as a pen, matches and toiletries. He also had a compass, torch, coins to the value of 11 shillings 5½ pence (approx 57p in today’s money), none of them dated after 1939, and a key. Despite considerable effort, the identity of Trow Gill Man has never been discovered. It was suggested that he had been a German spy, a claim unsupported by any documentary evidence from either British or German intelligence agencies. An obvious conclusion is that cause of death was by cyanide poisoning, but this could not be proved. The cave where this mysterious stranger met his sad end has subsequently become known as ‘Body Pot’ and is in an area called Clapham Bottoms. 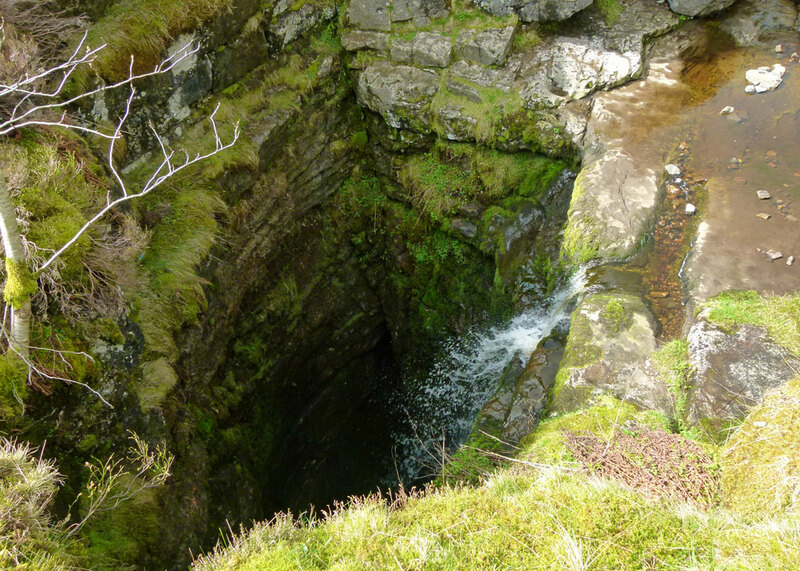 Another skeleton was also found at nearby Gaping Gill just a week later, on 31st August 1947. These remains have also never been identified, beyond belonging to a 25 to 35 year old male who had died two or three years before from falling into the cave. 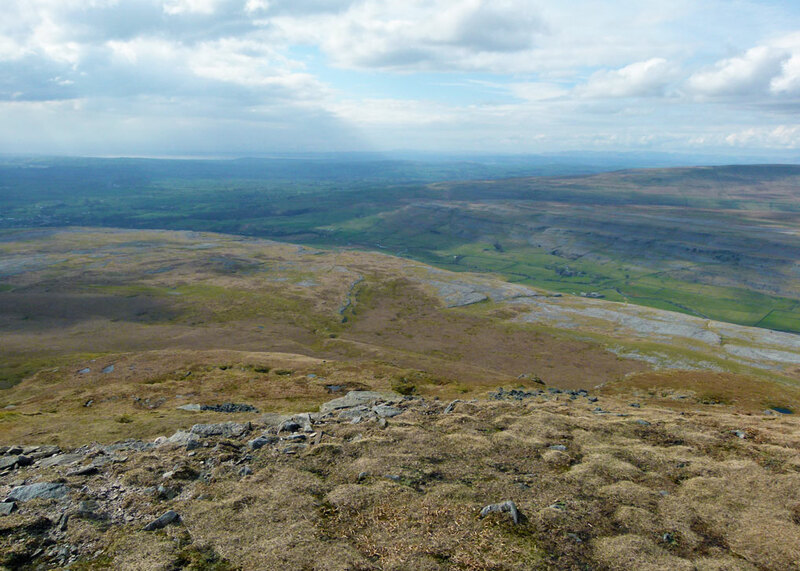 First climbed Ingleborough at age 11 it hooked me on the area and its hills. Been up it v many times since in all weather conditions, snow, ice, whiteouts, torrential rains. It never loses its appeal although it can be very busy nowadays. My last ascent was yesterday with some snow remaining at the top. BTW you omitted to mention the racecourse which the Victorians built around the summit plateau. It and the hostelry only lasted one day though torn down by drunken hooligans! The summit shelter is constructed from its remains. Thank you very much; I didn’t know about the racecourse, or the hostelry. Perhaps it’s just as well it was torn down – it would surely spoil the place. I’m pretty sure I’d need more than 4 hours these days! Fabulous area and very ‘do/able’ mountain for the reasonably fit. I’ve only done it twice with two young sons and my wife. Interesting stories. Been to this area several times – hope to be there end of next month- but never heard about the mystery dead man. Thanks for the post. Happy, safe and blessed climbing. Thanks for commenting – and apologies for the amount of time it’s taken me to say so! Hi Mike, really enjoyed this post. Thank you for the comments over at mine and the recommendation. Love the new look of your blog too. I always struggled to read white on black text. Thanks, Jacquie – much appreciated! Your photos of the area are stunning! Yesterday I heard about a group of girls who went hiking along a cliff near here in flipflops, trying to make their way down a very steep slope. It took police, firemen, and ambulance to rescue the girl who fell! People need to learn to go prepared! Weird about the unidentified bodies. Beautiful area though… I’d love to explore! I’d love to climb up there but would not want to explore any of the potholes further than what I can see safely from the rim. One day hopefully I’ll make it to Ingleborough, and if I do, I will remember your advice and approach it via Clapham. I would think on these types of walks be prepared for any weather may also be a good suggestion! If it’s all the same to you I’ll stand at the bottom and admire it from a distance. The weather in them parts is fickle, to say the least, and just cos you leave enough time to do the climb in daylight doesn’t mean you won’t fall foul of mists and other meteorological phenomena. Gorgeous part of the world though.